WW1 in the Balkans started when Austria-Hungary attacked Serbia in August 1914, but failed to overcome Serbian resistance. After the Ottomans joined the Central Powers, the decisive factor was Bulgaria. Its intervention on either side would swing the balance, but they harboured a deep hostility to Serbia after the Second Balkan War. While the Allies could only offer small territorial concessions from Serbia and (as yet neutral) Greece, the Central Powers' promises were far more enticing, as they offered to give most of the land Bulgaria claimed. On 21 September, 1915, Bulgaria began mobilising for war. With Bulgaria's mobilisation to its south, the situation for Serbia became desperate. The developments finally forced the French and the British to send a small expedition force of two divisions to help Serbia, but even these arrived too late in the Greek port of Salonika to have any impact on the operations. The Serbian army was caught in a pincer by the Germans and Austrians from the north and the Bulgarians from the south. The army was crushed and some 125,000 soldiers survived a horrific retreat through the Albanian mountains to Corfu where they were refitted. The allies established a viable front in Macedonia, although the British General Staff wanted to withdraw all their troops from Greece, but the French government protested. The Allied armies entrenched themselves around Salonika, which became a huge fortified camp, earning themselves the mocking nickname, "The Gardeners of Salonika". Officially, Greece was neutral, but King Constantine I was pro-German, while Prime Minister Venizelos was pro-British. At first, Greece supported the French-British military activity in saving the Serbian army, but after the Allies occupied Salonika gradually changed policy. Condemning the intervention, but unable to oppose, the superior Allied armies that had landed in Macedonia. The Germans, trying to keep Greece neutral, were careful not to cross the border. Knowing that Romania was about to join the Allied side, the Allies began preparations for an attack on the Bulgarian armies. The Germans, launched a spoiling offensive on August 17, just three days before the French offensive was scheduled to start. In reality, this was a Bulgarian offensive, with only a single German division on the Greek border. The attack achieved early success thanks to surprise, but the Allied forces held a defensive line after two weeks and then counter-attacked. By 19 November, the French and Serbian army had captured the key positions at Kalmakchalan and Bitola. The Bulgarian advance into Greek-held Eastern Macedonia precipitated a major internal crisis in Greece. The Government, determined to remain neutral, ordered its troops not to resist and they were forced to surrender to a token German force. The surrender of recently hard-won territory to the hated Bulgarians was seen by many Venizelist Army officers as the last straw. With the active help of the Allied authorities, they launched a coup which secured Salonika and most of Macedonia for Venizelos. From that point on, Greece had in practice two governments: the ‘official’ royalist government at Athens, which maintained Greek neutrality in the face of increasing Allied pressure, and the ‘revolutionary’ Venizelist government at Salonika. The main British front in Macedonia was at Doiran. This quickly developed into a typical WW1 battle of position, with trenches and emplacements. The British XVI Corps (Lt-Gen Briggs) in the Struma Valley fought a very different war. It comprised of a series of limited actions to capture Bulgarian and Turkish positions. The main reason, apart from the length of the river line, was that the river valley was infested with malaria and both armies avoided fixed positions there during the mosquito season. Malaria was a bigger cause of incapacity than enemy fire in the whole campaign, even the British forces’ newspaper was called ‘The Mosquito’. The larger actions would be of brigade strength launched from and against outpost lines, or sometimes just encounter battles as the other side raided or probed into the Valley. Examples included the capture of Karajakoi by 81st Brigade, consisting of the Royal Scots, Black Watch, Cameron Highlanders and the Argylls. Attached to XVI Corps were several battalions of Venizelist Greek troops who took part in some of the later actions. By 1918, when Greece formally declared war, a whole Greek corps was stationed on the Struma. This gives us an excuse to field our Greek miniatures. These actions in the Struma Valley form the backdrop for the game. 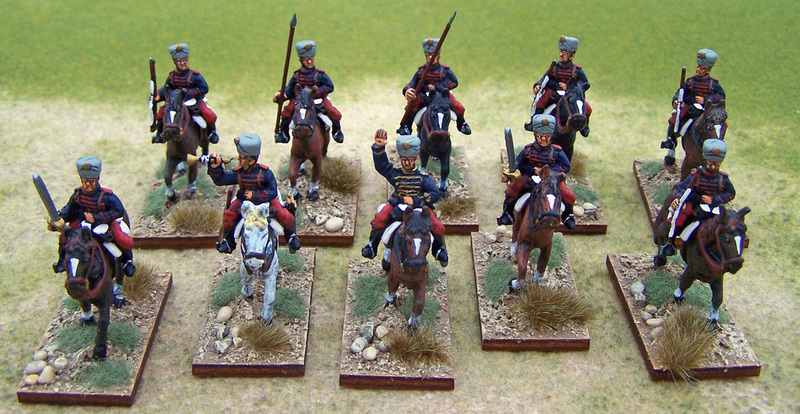 The scenario tasks a composite allied Battlegroup of Greek and British companies with attached cavalry and artillery to cross the Struma and eject Bulgarian and Turkish troops from their advanced positions in the Valley. German troops are also in the Valley. 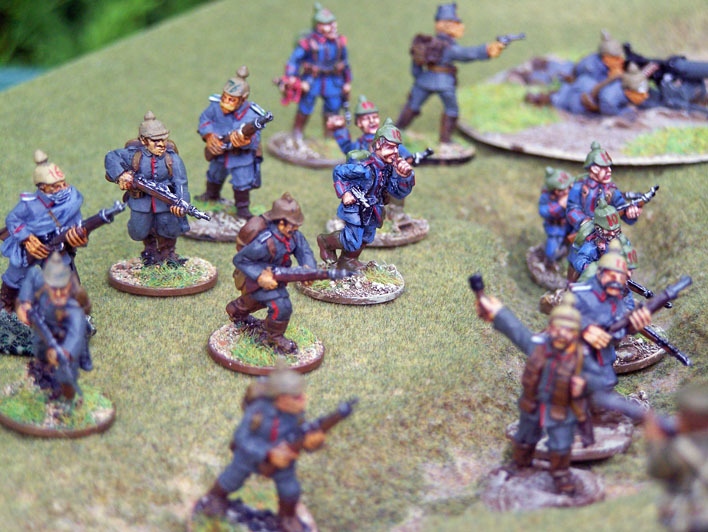 The game is played using Warhammer Great War rules with 28mm figures. 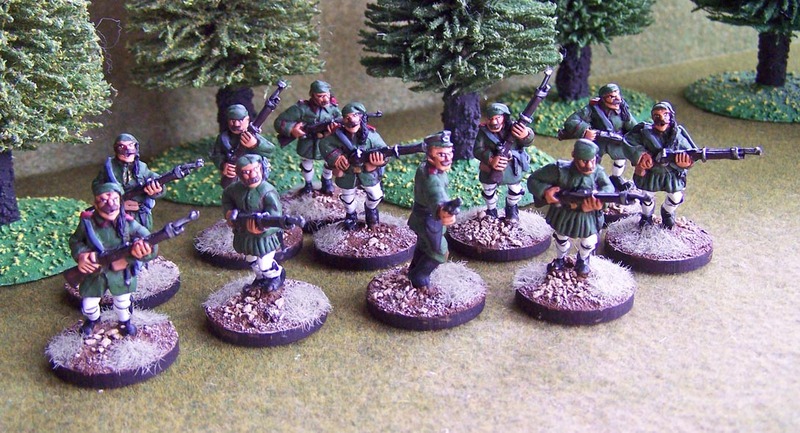 The Greek and Bulgarian figures are from the Tiger Miniatures range. 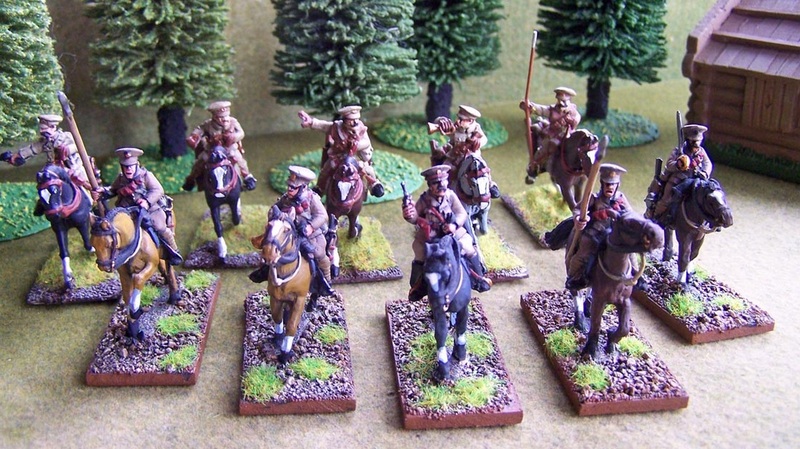 The German and British forces are from several ranges. The best one volume history of the campaign is Under the Devil’s Eye – Britain’s Forgotten Army at Salonika 1915-18 by Alan Wakefield and Simon Moody (2004). This book has a chapter on the actions in the Struma Valley. For more detail there is the official history Military Operations – Macedonia (2 Vols) reprinted by the Imperial War Museum. As usual in WW1 there are also many memoirs of those who fought there as well as Alan Palmer’s earlier history,The Gardeners of Salonika.